The Daily Dish owner Zena Polin invites me to come in to the restaurant for dinner. She notes that it’s been awhile since I’ve dined there and she wants me to experience some recent changes. Co-owner, Jerry Hollinger is now Executive Chef and they have hired a French sous chef. Plus, there are some additions to the decor. I last dined at Silver Spring’s The Daily Dish in August 2011 and while I had every intention of going back, it hasn’t happened yet. This is an offer I can’t refuse. 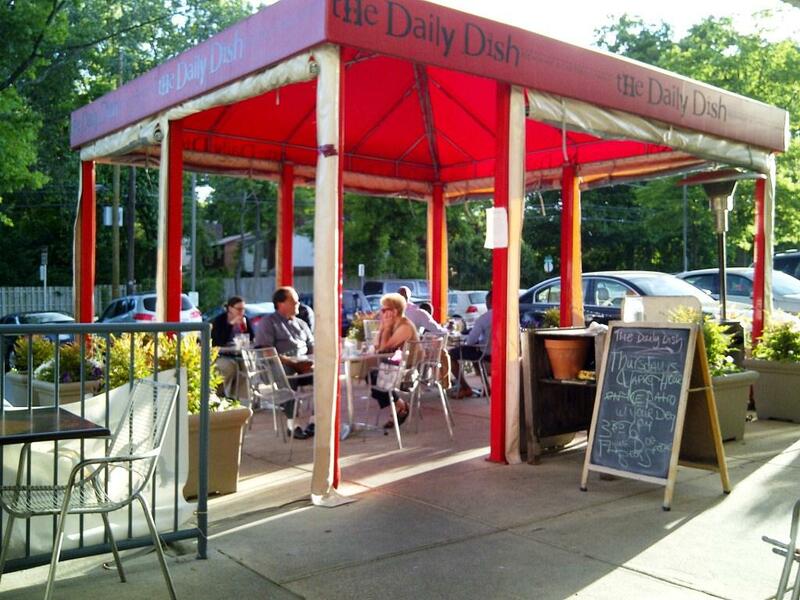 The Daily Dish is the perfect neighborhood spot with a California-esque decor that’s as inviting as the cuisine. The open air storefront and covered patio make it an ideal warm-weather destination. If I could be a regular anywhere, this would be the place. Unfortunately, I have commitment issues when it comes to dining out. But I’m thinking about getting serious with a couple of places and The Daily Dish is one of them. Dinner begins with a warm welcome from Zena, which is how she greets all her guests. She introduces us to the new bartender and his updated list of drink selections. I’m not feeling great, but this doesn’t stop me from ordering the Peach Jalapeno Martini. I ask that the drink be served light on the alcohol. I’m more interested in the flavor, which is a delightful balance of sweet and spicy. I may like my husband’s Chase’s Lemonade even better, a tart mix of beer, vodka, and lemonade. There are quite a few appealing selections on this cocktail menu. I really need to return for the Ginger Martini, or perhaps the Pepperoncini Martini, which sounds intriguing. 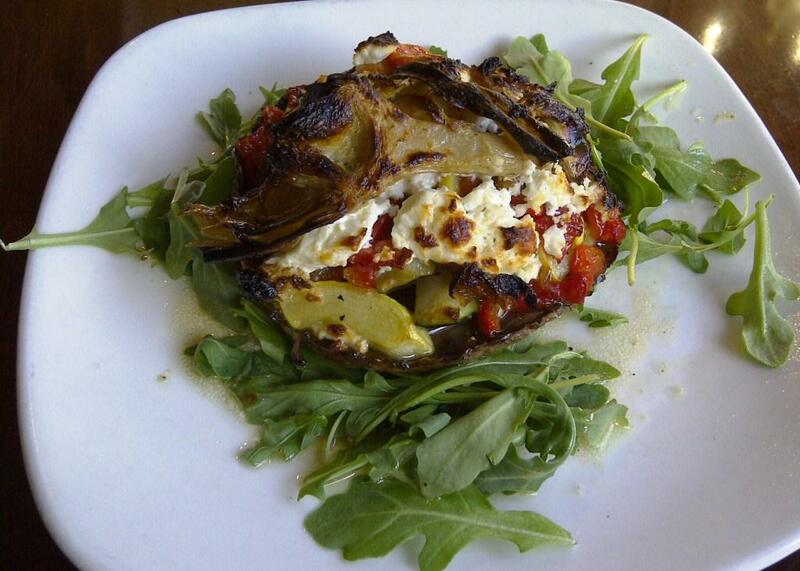 We begin with an appetizer of grilled vegetable on roasted portobello cap with fresh basil and sheep’s milk feta cheese. My husband comments that this dish is so satisfying he could easily make it his meal. We are also served panko breaded cod cheeks with lobster cream sauce and wilted watercress. I thoroughly enjoy the light crispy coating with this sweet and meaty fish. This dish makes an appearance on the menu as a daily special. It is special indeed. 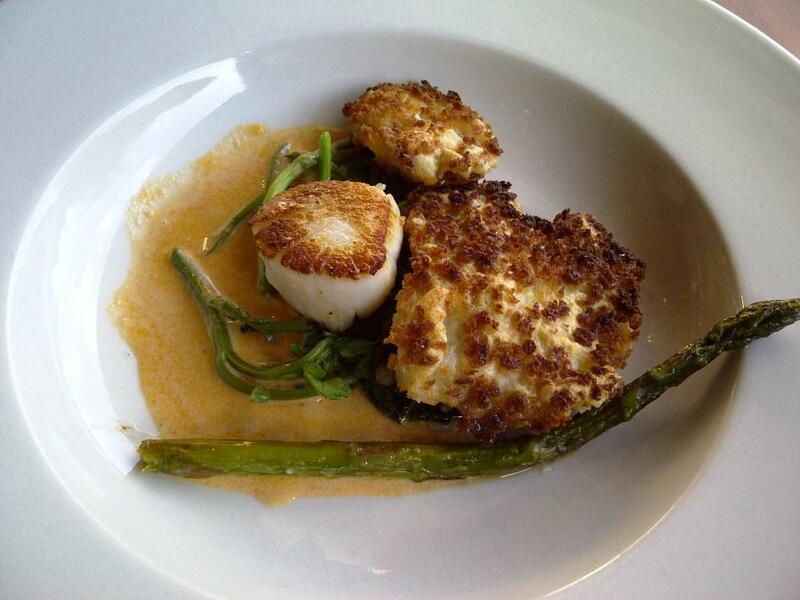 Chef Jerry has added a perfectly seared scallop on the side. I would have been perfectly sated had I stopped here. Of course, I didn’t. My entree is pan roasted monkfish filet in a lobster cream sauce (the same sauce that was on the cod cheeks) and garnished with asparagus, leeks and shiitake mushrooms. 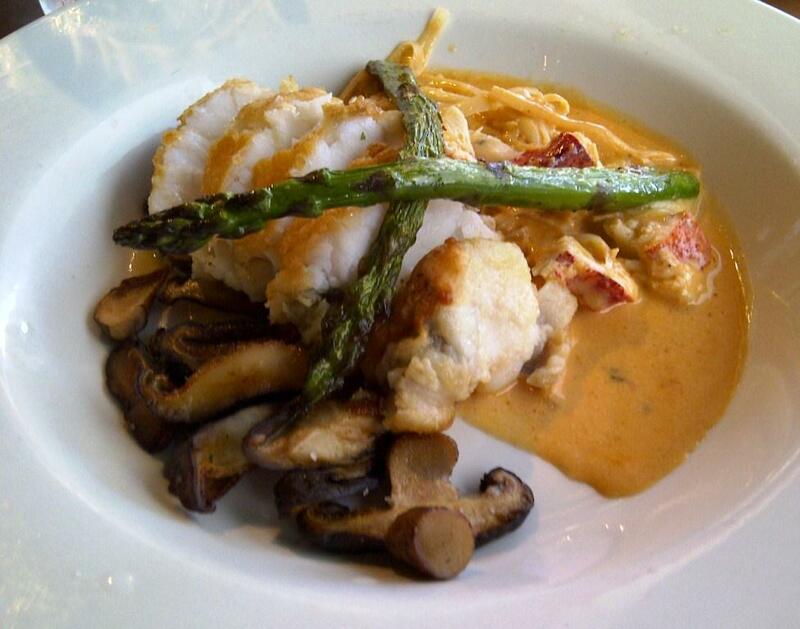 The monkfish holds its own against the rich creamy lobster, even though it may be considered a poorer relative. 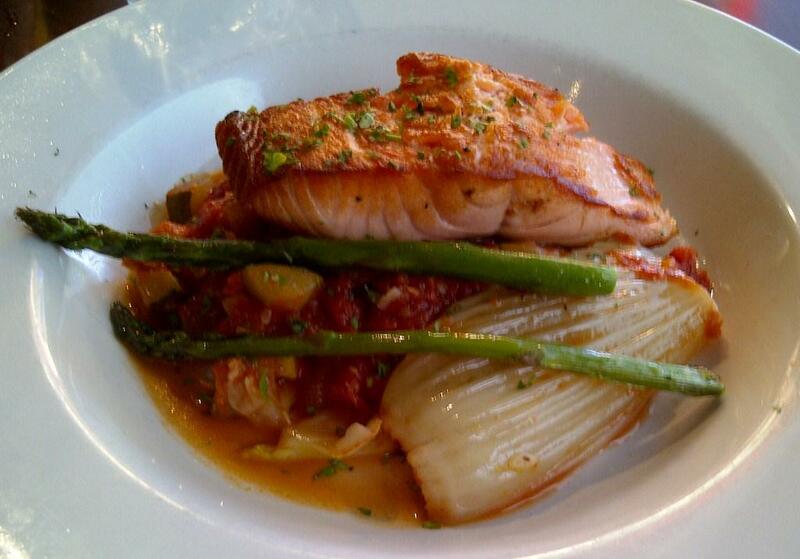 My husband has a beautifully charred Black Pearl salmon atop ratatouille with red pepper. The seafood dishes at The Daily Dish, paired with fresh seasonal vegetables, clearly shine. What I really like about the place is that you can have an upscale seafood dinner one night, and on another explore the far more casual side of the menu featuring burgers, pizza, and salads. When I first wrote about The Daily Dish, I disclosed that I had met Zena and Jerry at an event for food bloggers. Someone on a discussion board called me out for “being courted at a blogger cattle call and getting special treatment.” I felt vindicated when a number of my friends visited the restaurant on their own and consistently reported back to me about their great experiences with the food and service. I pride myself on honestly when it comes to my blog, and I’m offering full disclosure that my husband and I were treated to dinner at The Daily Dish. I’m confident that our meals here are fully representative of The Daily Dish experience. If you visit, I invite your comments below. In the meantime, I’m determined to make The Daily Dish a steadier date. Just this evening my family stopped for an early dinner before going to the AFI. I throughly enjoyed two of the largest and most succulent soft shell crabs I’ve ever eaten. On tap, locally brewed Port City “Optimal Wit” was my choice for beverage. A good one. Going back next Sat to celebrate two birthdays. Looking forward to it.